Batman has a lot of gadgets. He has the Batarang to help him take down bad guys from afar. He has the grapnel gun to help him travel to the heights of tall buildings in mere seconds. He has smoke pellets to help him escape deadly situations. His Bat-tracer can help him track villains to the ends of Gotham City and his nifty utility belt helps him keep his cool gizmos neatly organized. For the most part, he themes his gadgets after bats, but we found one gadget he likes to use that isn’t bat-themed. Yes, when Batman kicks back for a little rest and recovery, he likes to crack open a few root beers with his trusty Joker bottle opener. Batman is always struggling to capture the Joker. This Joker bottle opener is an easy way for him to feel like he always has the upper hand against the notorious baddie. 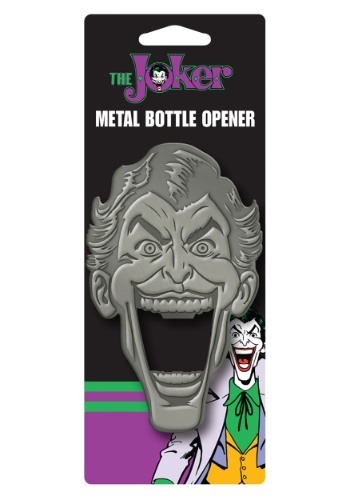 This metal bottle opener is designed to look just like Batman’s greatest adversary. It’s molded with a giant mouth that opens your bottles when you place the cap in there. We’re pretty sure Batman keeps one of these in his utility belt for those days when he just needs to relax with a bottle of soda!